Really simple low syn coleslaw as pre-made coleslaws can be very high in syns!! 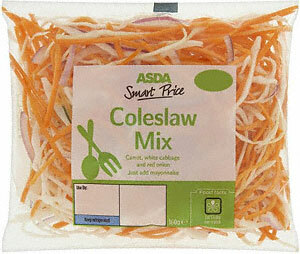 Asda sells ASDA Smartprice Coleslaw Mix (160g) in the fresh prepared salad/veg section for only 50p. Asda/Hellmans/Heinz Extra Light Mayonnaise and its only 1 syn!!! Note that if you use any other type of mayo that isnt extra light it will be more syns. Make it a habit to tell people thank you. To express your appreciation, sincerely and without the expectation of anything in return. Truly appreciate those around you, and you'll soon find many others around you. Truly appreciate life, and you'll find that you have more of it. See the link below for more info.